It is best practice to name your computer something descriptive and unique. 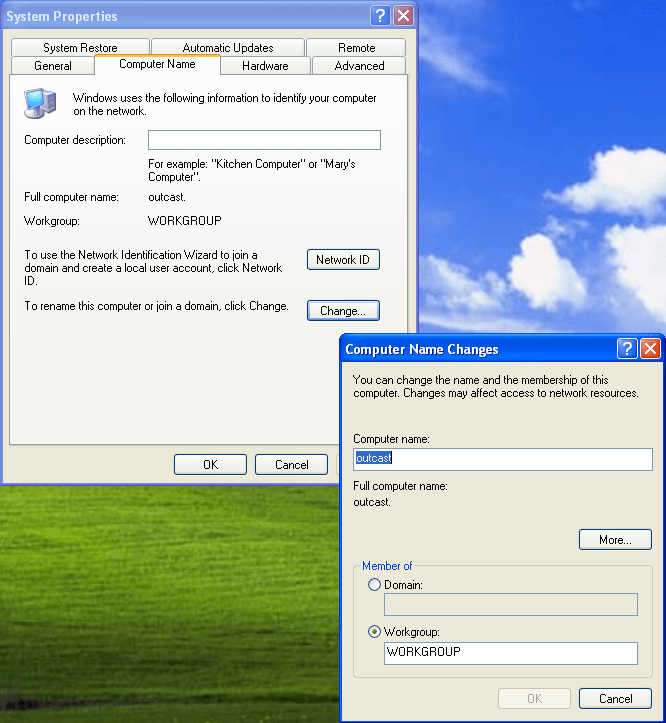 If the name is not unique amongst the computers on its network, you will get a NetBIOS Naming error and likely will not be able to connect to network resources from either machine. In order to rename your computer, you need to go to the System Properties. To get there, either right-click on My Computer and go to Properties or use the keyboard shortcut Windows Key + Pause|Break. Once you’re inside the window, switch to the ‘Computer Name’ tab. On that tab, you’ll see a button below that says ‘Change…‘ Click that button and a new window will popup. Change that computer name to what you would like. Again, I would recommend something descriptive and unique like ‘JMHOffice01’. Hit the ‘Ok’ button twice and you’ll need to restart your computer. Of course, if you are in an enterprise environment with your own IT, you shouldn’t change the computer name without their permission. Hostname and computer name correlation goes a long way to keeping inventory straight and remote access easy.